Thanks so much for stopping by. I appreciate you giving me the opportunity to share all I know and have come to love about this great game. It is my greatest wish that you’ll refer back to it time and time again to learn something that maybe you didn’t know before or find through your own efforts. This is a game of life for life. I am honored that you trust me while assisting you in using my knowledge and experience to provide the opportunity to earn that trust. 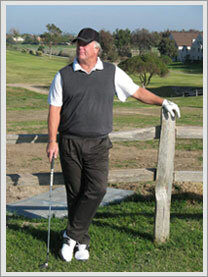 My interest in golf started in my early 20s – some 38 years ago. I picked up some old clubs in a thrift store and drove to a local par three golf course in Arcadia, California. There I met a large bucket filled to the top of what appeared to be cracked rocks with funny names on them. Well I watched a few people on the range for some time and then started slashing at them with an old persimmon 5 wood I bought, and within the first ten minutes I was getting them out there a good 20 yards or so, and the divots 25! Needless to say, I needed a transfusion from the exertion I was putting on all that swinging, but after about a week, I was finally getting them off the ground – you know about 100 yards now. I didn’t know how or why, but they were just flying better. A young man, close to my age, stepped up next to me one day while I was wearing myself out and said, “Hey man, how come the shaft on that 5 wood is so bent?” Well it did have a nice long curve in it by now, so I figured clubs just molded themselves to each golfer. He said I was playing the ball too far back behind my right foot and hitting straight down on it like I was chopping birch wood. “On top of that, your balls are headed out over the fence.” I asked him if that was such a bad thing and he said, “Well, when they turn right going that fast it is.” We soon became friends and he continued to help me and it wasn’t long before he got me hitting the ball where I could actually find it. I was now hooked. What I learned from that experience had nothing to do with hitting golf balls, but that I had experienced something from a total stranger. Somebody saw something I didn’t and he felt compelled to share his knowledge to make it better for me. For more than 30 years now, I’ve been doing for others what he did for me. This is the best game in the world. Currently I play with a local tour and have played in many charitable tournaments and once paired with Al Geiberger and Bobby Nichols, which was a great day to remember. 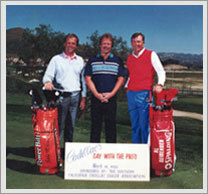 Attended several clinics over the years given by numerous tour players like Arnold Palmer, Lee Trevino, Chi Chi Rodriquez and others in addition to years of lessons from my friend and Long Driving Champion Mike Austin, who by the way, is in the Guinness Book of World Records for the longest drive in tournament play at 515 yards off the tee. Mike’s fantastic feat was recorded in The Guinness Book, at the tender age of 67 years old. Yes, that means there’s still hope for all of us. I’ve been a good student of the game in those 38 years, bringing many talents to the table with desire in sharing the best of those years with you. My hope is that you’ll use my experiences and techniques to improve your game, as others have done for me. At the time of this writing I’m a scratch golfer. I feel confident in my diverse abilities to assist you towards the betterment of your game and look forward in earning your trust. The very purpose of this book is to help you build on techniques, that you may or may not be aware of or currently using. These techniques involve the combination between mental imagery, equipment, training aids and the desire by you, to maybe play better than you played last time. Together and not separately, they will develop a blueprint for the enrichment of your golf experience. It’s my intent, on helping you to draw those useful blueprints. This mental blueprint will manifest itself through commitment by you, which results in higher confidence and that result is lower scores. The choice to play better golf is yours. The tips and products offered here won’t guarantee you success without some effort on your part. Think of this experience as you wanting to build a house and I’ll provide you with the blueprints and the experience on how to put them into action. I’ve prepared these golf tips for your benefit, to use as your personal house key, to unlock the door of your mental blue print. You should use my experience and recommendations, to find common ground within your own game. From there, you’ll take that experience to your next golf outing, with a renewed vigor and road map to a more enjoyable game. In return, I would say to you, that the highest compliment my customers can give me, is the referral of friends, family and business associates, that they may also find some enrichment and experiences, that will have a profound and positive effect not only in their lives, but in their love they have developed for this wonderful game.